Baby calves, just weeks old, are kicked, punched, slapped and yelled at by barn employees. Some are grabbed by the testicles in an effort to force them into narrow wooden stalls. Several are lying gasping for air on urine- and feces-stained slats. These are some of the disturbing images revealed in undercover video footage shot by Mercy for Animals Canada at a milk-fed veal barn complex in Pont Rouge, just outside Quebec City. 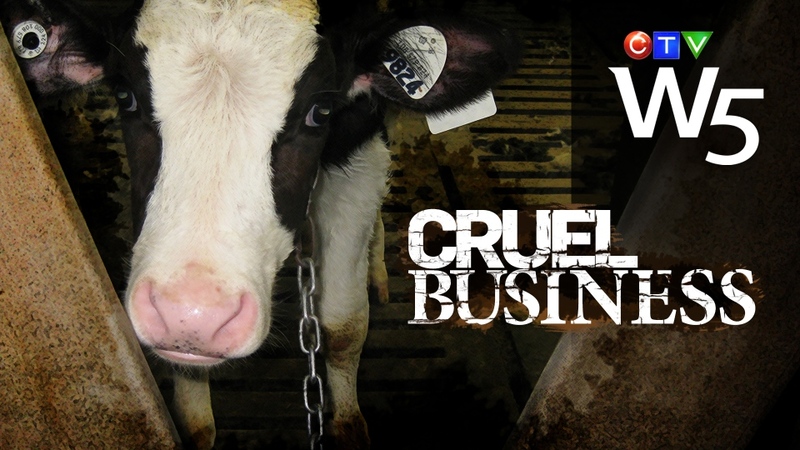 It was obtained by CTV’s W5 as part of its investigative report on the Quebec veal industry. At the Pont Rouge barn, about 800 calves are subjected daily to harsh treatment and inhumane confinement for the entire 18 to 20 weeks of their short lives. They are housed in crates so narrow they can’t turn around or lie down comfortably. Many are tethered by chains around their necks. The crates, most of which are no more than 49 centimetres wide, are designed to prohibit exercise and normal muscle growth in order to produce tender veal. The calves are fed a milk substitute diet purposely low in iron so that their flesh will stay pale. The calves never go outside to play, breathe fresh air, clean themselves or bond with their mothers. They never see sunlight. Most of their time in the barn is spent in the dark. Veal farming is a direct by-product of the dairy industry as all veal calves are male offspring of dairy cows. Dairy cows must be impregnated annually to continue producing milk. About half of their calves are male and of no use to dairy farmers. Quebec is the largest producer of milk-fed veal in Canada, producing 80 per cent of the so-called white veal. In 2013, 165 farms in the province raised almost 150,000 milk-fed calves. The undercover investigator with Mercy for Animals, a non-profit organization that campaigns against what it calls “cruel farm practices,” applied for the job at Pont Rouge through an online job site, and worked there for two months wired with a hidden camera. Jean Jacques Bonnet is an animal technician who oversees the raising of the calves at the barn. It’s his job to visit barns like this one weekly to monitor conditions. W5 showed Bonnet the video. Visibly shaken by what he saw, he insisted he was not aware of what was happening there. He blamed the workers who, he noted, are no longer employed at the barn. “If I had been here and witnessed what I saw in the video . . . well, I am strong enough to grab someone by the shoulders and throw him out even if it would cause me problems afterward,” he said. In Quebec, there is a Code of Practice setting out the conditions for the treatment of veal calves. Last updated in 1998, its 20 pages are filled with recommendations on the care and handling of veal calves, but the Code is voluntary. “I’m unaware of any code that exists,” the undercover operative said, adding that he was “never told or shown any sort of guideline” on how to deal with the calves. In one horrific sequence, a worker shoots a gravely ill calf with a .22 calibre rifle. The animal does not die right away, but suffers on the floor bleeding profusely from the head. The worker returns and fires a second bullet to the head. The video was also shown to Fabien Fontaine, a key member of the Quebec Veal Association and the owner of Delimax Veal, one of the largest producers of milk-fed veal in the province. His company delivers the calves to the Pont Rouge barn and will pick them up to bring them to the slaughter house. His drivers also deliver the milk by-products to the barn to feed the calves. Fontaine pointed out that Delimax does not own the Pont Rouge operation. But he noted that the future for milk-fed veal calves in Quebec will soon be much more humane. Fontaine took W5 on a tour of a Deimax veal operation near Drummonville. There, calves are raised in group pens allowing them to mingle with each other and giving them a little more room to move around. They even get an occasional treat of grain and corn. He added that this new system will be the norm for the Quebec veal industry by 2018. There are 120 veal operations in Quebec that use wooden crates, about 75 per cent of all the barns in the province. At the time of the report, the farm facilities in Pont Rouge, Quebec, were leased by Les Industries Agroveau Inc., who raised calves on the site on behalf of Montpack International. The owners of the farm only lease out the facilities, are not involved in any way with the veal farming operations, and have no responsibility for the practices, actions or animal abuse seen in our report. 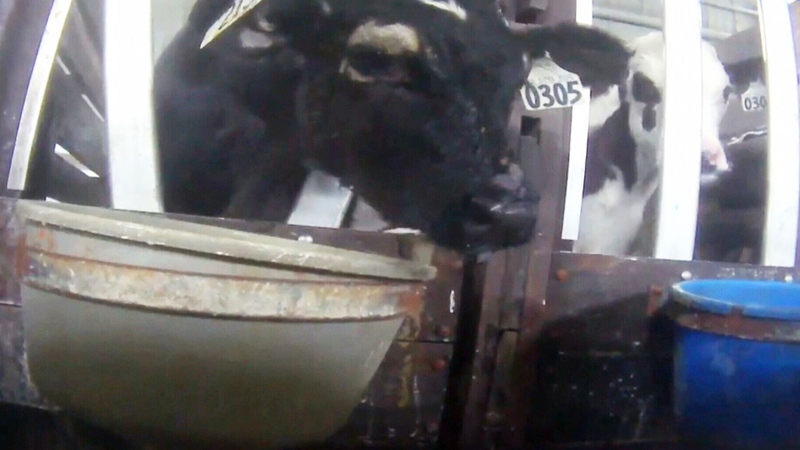 These are some of the disturbing images revealed in undercover video footage shot by Mercy for Animals Canada at a milk-fed veal barn complex in Pont Rouge, just outside Quebec City. 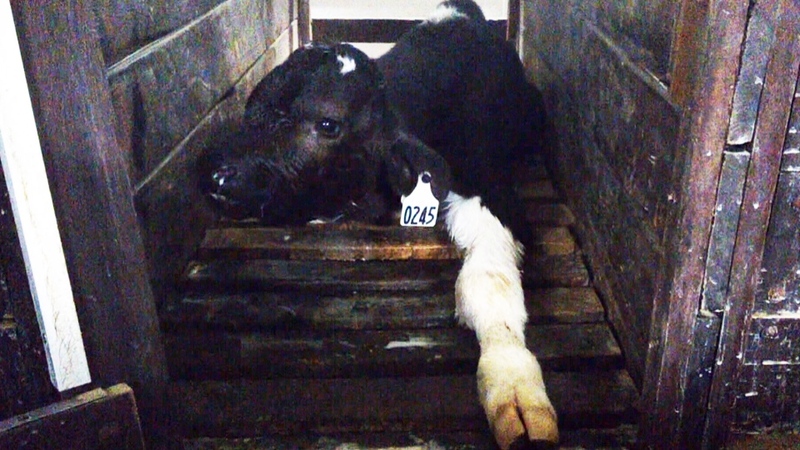 Baby calves, just weeks old, are kicked, punched, slapped and yelled at by barn employees.